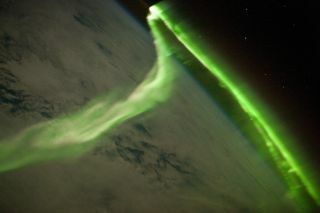 An aurora australis, the southern version of the phenomenon, as seen from the International Space Station in 2010. Auroras paint the sky around the poles when the sun is particularly active, flinging highly charged particles at Earth's atmosphere. Scientists once thought that the gorgeous events were mirror images, but to their surprise, displays at the north (the aurora borealis) and south (the aurora australis) don't precisely match. Ever since scientists realized these two celestial displays don't line up, they've been trying to sort out why. Now, a team of researchers thinks it has found the reason — asymmetry in Earth's magnetic tail. But what's stranger is that the asymmetry is caused by the precise inverse of what scientists expected. It all comes down to Earth's magnetic tail, which is created by interactions between our planet and the sun. Those interactions begin with Earth's magnetic field, which scientists believe springs from the innards swirling through Earth's core and creating an electrical charge. Magnetic fields — from refrigerators to planets — create invisible magnetic field lines arcing between the North and South Poles that can govern the behavior of material around them. But Earth's magnetic field isn't the only one out there — the sun also has one, which affects the constant flow of highly charged plasma particles that streams out in every direction. The magnetic field embedded in that stream, called the solar wind, interferes with the one Earth produces, squishing it on the daylit side of Earth facing the sun and stretching it on the nightside facing away from the sun into a tail-like shape. Instead, the team behind the current research realized that the solar wind's magnetic field doesn't always line up precisely with Earth's. When it's skewed, it introduces asymmetry between the North and South Poles into Earth's magnetic field — and that, in turn, causes the mismatch between northern and southern auroras. So, the researchers gathered simultaneous far-infrared observations of northern and southern lights and tracked how closely the two auroras matched. Then, they added in data about reconnections in Earth's magnetic tail. But when they compared the two sets of measurements, they saw exactly the opposite of what they had expected to see — instead of these dramatic reconnections increasing the asymmetry of auroras, they nudged the auroras back into matching. Understanding the auroras themselves isn't vital, as auroras are just symptoms of how the sun affects the Earth through a set of phenomena called space weather. But space weather can interfere with navigation and communication satellites and even put power grids out of commission. And scientists are still trying to figure out precisely how space weather works and how they can better predict it. Auroras are just the prettiest phenomenon to start cracking. The research is described in a paper published last month in the Journal of Geophysical Research: Space Physics.